It's fall and things are turning autumnal everywhere you look, especially when it comes to people's palates. For example, everyone is promoting autumnal flavors such as cinnamon and spice and drinks such as pumpkin flavored lattes and whatnot. But instead of craving these flavors of fall, I had a different craving last weekend: lemons. This craving first manifested itself last Saturday after a long day of walking around L.A. in 100+ degree weather. A little on the dehydrated side, I wanted nothing more than a lemon sorbet or gelato to cool me off, which I ended up buying and paying the exorbitant fee of $5 for, even though I lied and told my husband it was $3. The next day I wore this lemon motif sweater. Yes, it's a sweater, which makes it somewhat fall appropriate and also explains why it's been siting in my closet for months without wear, but on the other hand, the lemons make it more spring/summer. 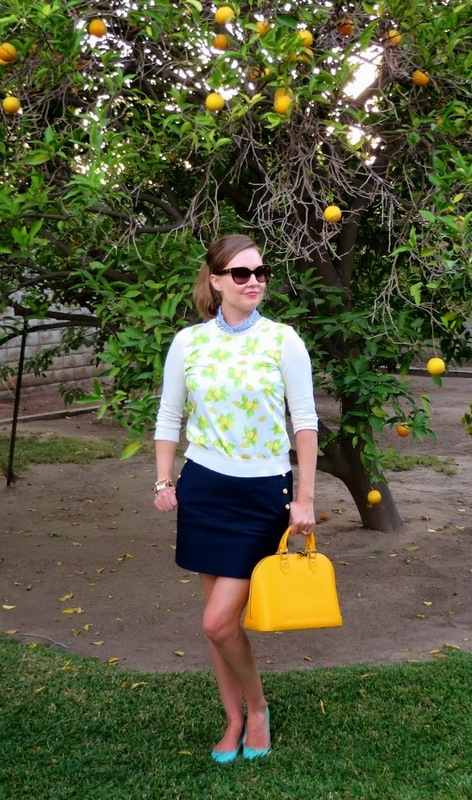 So to make my lemon sweater more fall appropriate, I paired it with a navy skirt and jeweled collar blouse underneath. 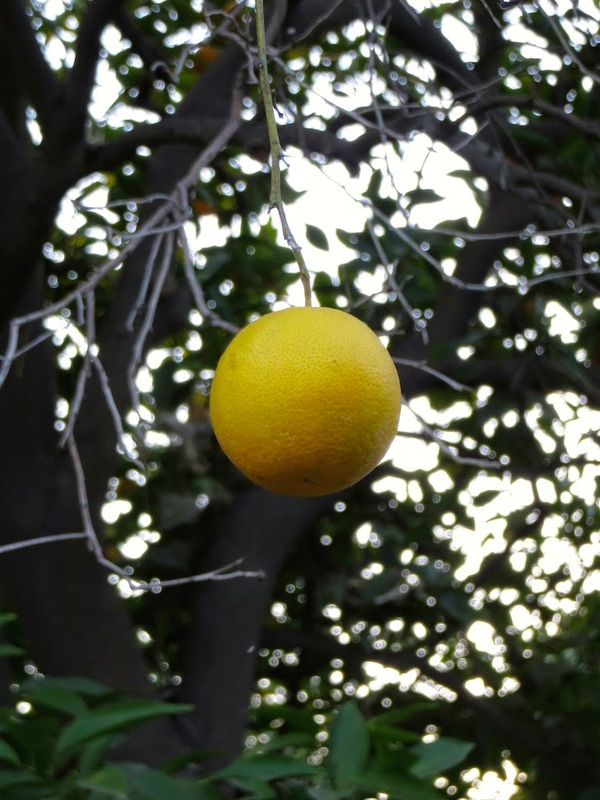 I'm not sure what new cravings I'll have this weekend, but it's safe to say that lemons and citrus are still some of my favorites, but I am a California girl after all. Your lemon sweater is beyond gorgeous and so is the embellished collar of your blouse. I have a similar nautical mini skirt which I love. You look gorgeous (as per usual). And your latest comment on my blog, made me laugh too lol. P.S. What is your e-mail address? Adorable top! 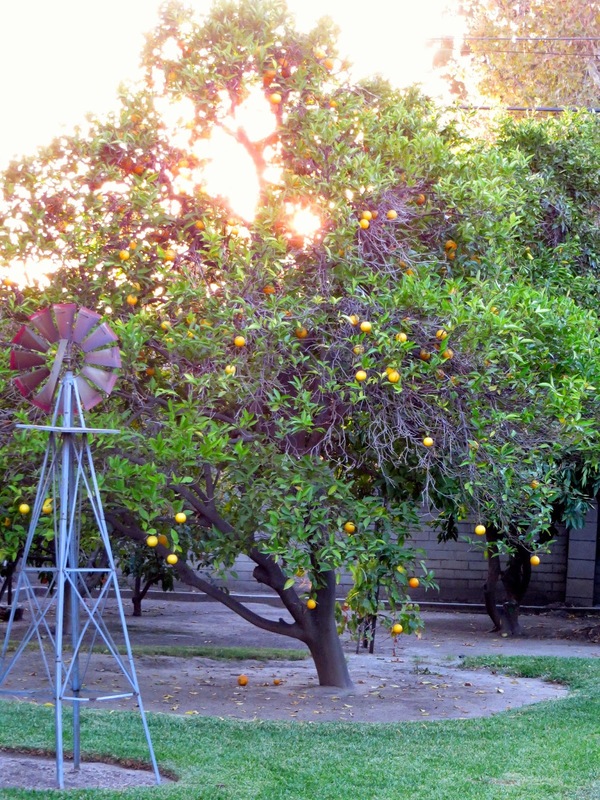 I wish my lemon trees would start to turn, they're all green still. Thanks for linking up with me for Fab Favorites today! Thanks Meaghan! 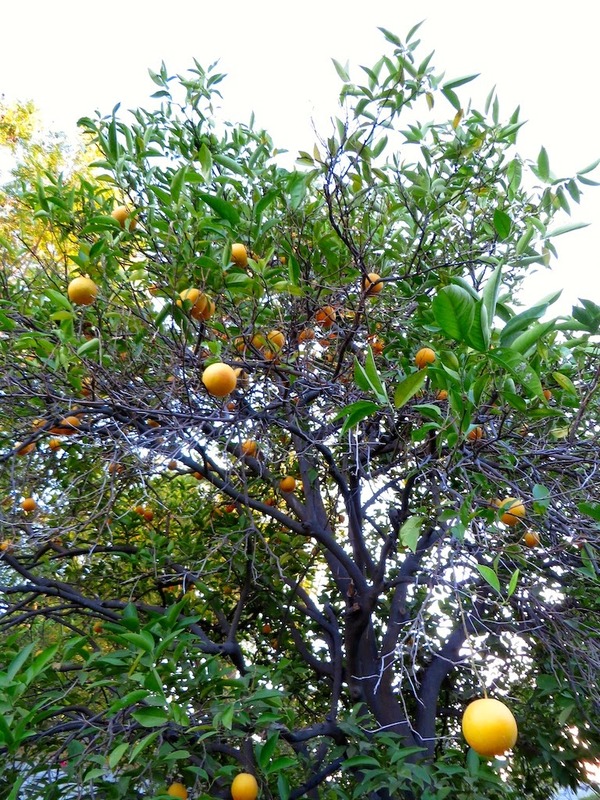 Actually, these are our orange trees because we have the same problem with our lemon tree (they are still green) which is why I didn't use them in my post! 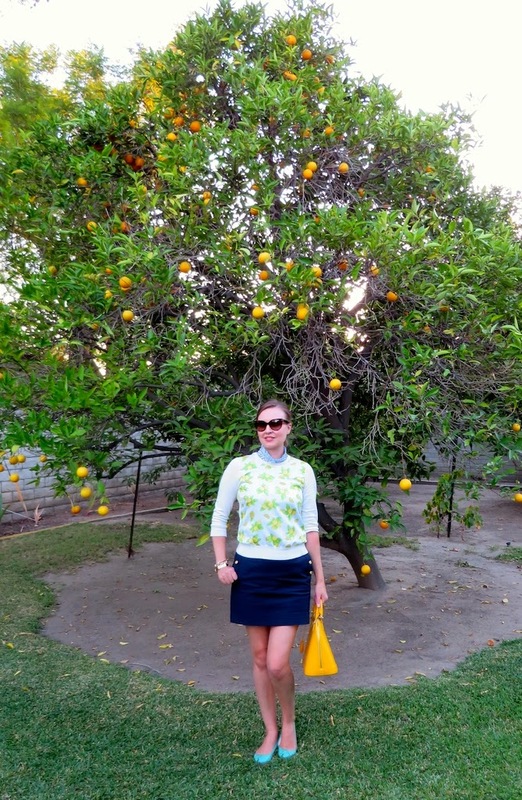 I love that top, so delightful I bet it makes you smile when you take it out of your closet Love your lemontree too. THe bag is so prettty as well. Love how you styled it! Thanks Jessica! This top definitely makes me smile. I think anything yellow/lemon color brings out a smile! I appreciate you stopping by to say hello! You should make lemon curd! ;) Love the top, and your trees are beautiful. Lemon curd sounds delicious! I think lemon squares, with a nice helping of powdered sugar on top, if made right are one of my favorite desserts. Sadly, I still haven't founds a really good recipe! This is such a pretty blouse and sweater, they make a great combo! Let me know if you'd like to follow each other? I know, I love anything with lemons and citrus because I live in SoCal. It's cool to be able to grow all of these things in your backyard too! Thanks for stopping by!